Are you looking to buy a townhouse to call home in Manila? If so, and if you feel overwhelmed during the house-hunting process, you are not alone. The beautiful city of Manila, and, in particular, San Juan City, has many amazing properties from which to choose, and it’s helpful to have a guide to help you find the property that best suits you. 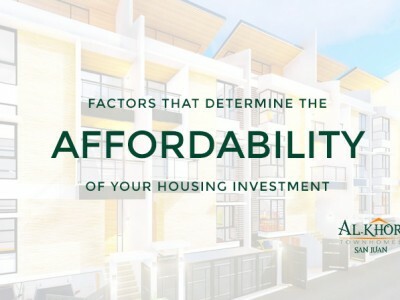 That’s why we’ve put together these five must-read tips for buying a townhouse in Manila. A townhouse is a great option as it is spacious with two or three stories and usually less expensive than a single family home. It is advisable to have a quality sales agent to help you with your search for buying the townhouse of your dreams. This sales professional understands the housing market and can find you the properties for sale within your budget and that meet your criteria, including the number of bedrooms you envision. The agent can also provide you with vital information about a property, fully understands Philippine laws and can help you get a mortgage loan you want. When you are looking at a townhouse for sale in San Juan or within another part of Manila, check for the local community accessibilities. For example, is there are place nearby to buy groceries easily? Is there a bank, church or mall close by that meets your expectations? Also examine the transportation routes in the area to ensure you could easily get around there if you purchase the property, or that your children can visit you easily there. Another tip for buying a townhouse in Manila is to visit the prospective location during different times of the day. What you want to see is whether the neighborhood is noisy at certain times of the day and how much traffic the street gets during the day versus at night. Then you can decide whether what you see or hear is going to be something you can get used to every day. Research what the average townhouse in San Juan or another city in Manila typically sells for. While you may not have the expense of children living with you, what you do need to consider is whether you can comfortably afford the average property price in the area. As well, ensure that you don’t get overcharged during buyer negotiations by being knowledgeable about reasonable prices in the neighborhood; a sales agent can help you determine these values easily. When negotiating a deal on the townhouse of your dreams in Manila, don’t forget to leave room in your budget for paying taxes. Buying real estate comes with the assumption that you will pay for the documentary stamp tax, transfer tax and registration fee (with the seller paying other fees). This is a standard procedure in the Philippines, although you may be able to negotiate with the seller for a slight alteration on the pricing structure. Make sure you keep these taxes in mind during the buying process so that you stay within your budget. That way you won’t buy yourself into debt, which only takes away from the excitement of owning a new property. There are many great areas for shopping and dining in Manila, which makes it an ideal place to buy a townhouse. Follow the five tips above to get the best experience buying a townhouse in San Juan or another local city so that you can truly enjoy the experience of living in the culturally-rich, beautiful location. Make the most of your retirement, time without the kids or the joys of treating yourself to a property that you have always dreamed of obtaining – you deserve it, and an affordable one is close by, within reach, in Manila!